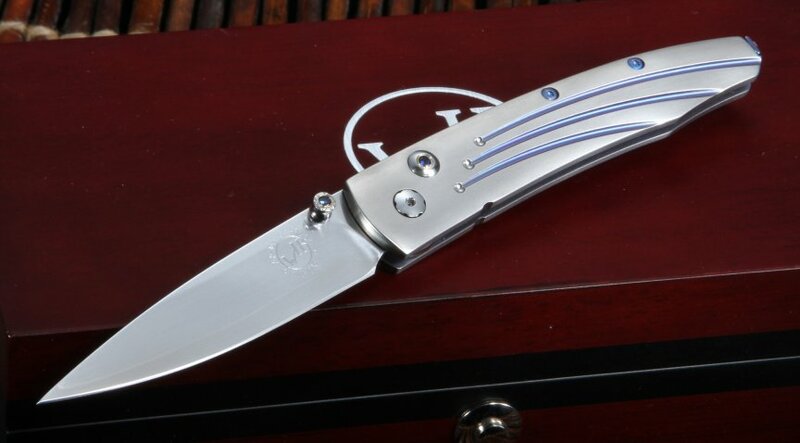 Hand-crafted with luxurious and high-quality materials, the American-made B10 Vanguard folding knife is an accomplishment in craftsmanship that is paralleled only by a very select few. If you have a taste for the precise and are in the market for a finely crafted knife that is as versatile and practical as it is elegant, the B10 Vanguard is a solid choice. The B10 Vanguard's 2.75" blade is constructed from ZDP-189 stainless steel, a tough steel alloy that can really hold an edge. The blade and handle have a hand satin finish for a clean refined finish. 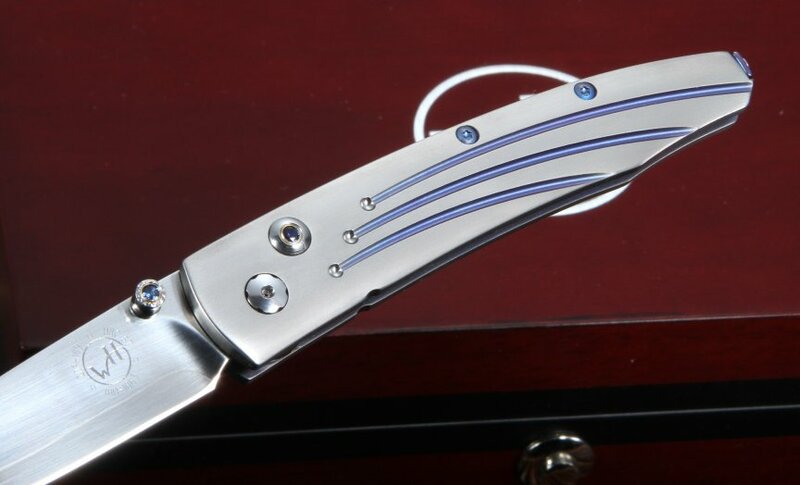 The B10 lancet model is held together by a titanium frame and handle complimented by a one-handed button lock and thumb stud inlaid with subtle Kashmir blue topaz. 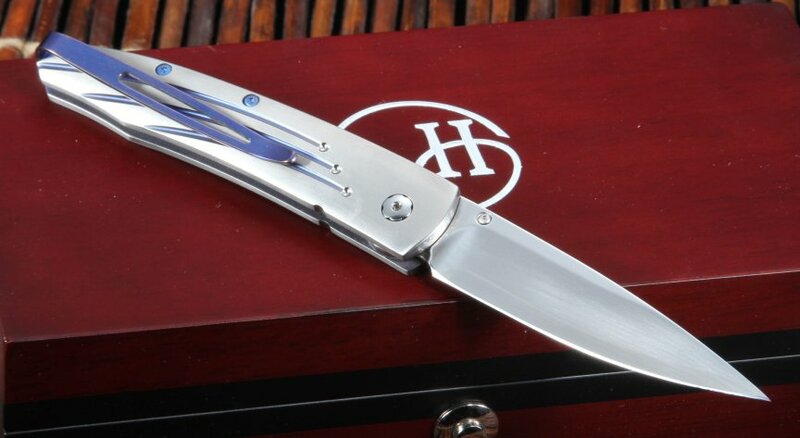 William Henry spares no expense in the design of their knives, only including top-shelf materials in their designs. Measuring in at 3.63" folded and 1.3 oz., the B10 Vanguard is a compact knife that packs a deceptive amount of power for its size. Equipped with a blue anodized titanium pocket clip that matches the Kashmir topaz lock and thumb stud, the B10 Vanguard is pocket-ready and can be carried discretely wherever life takes you. Additionally, this individually numbered knife comes with a beautiful wood box with a certificate of authenticity. 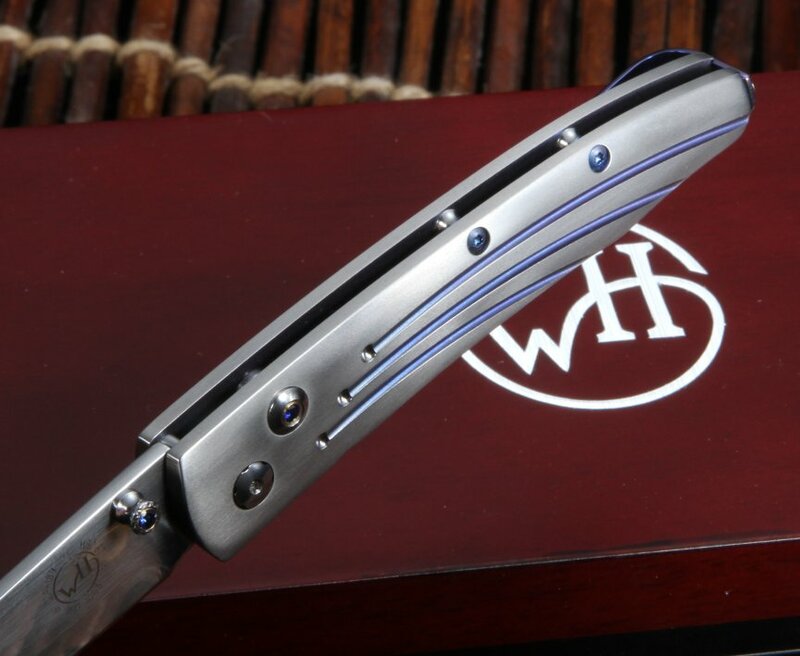 Truly a gentleman's tool, William Henry's B10 Vanguard is a worthwhile investment if you're in the market for a upscale, medium-sized everyday carry knife with aesthetics to match its utility. 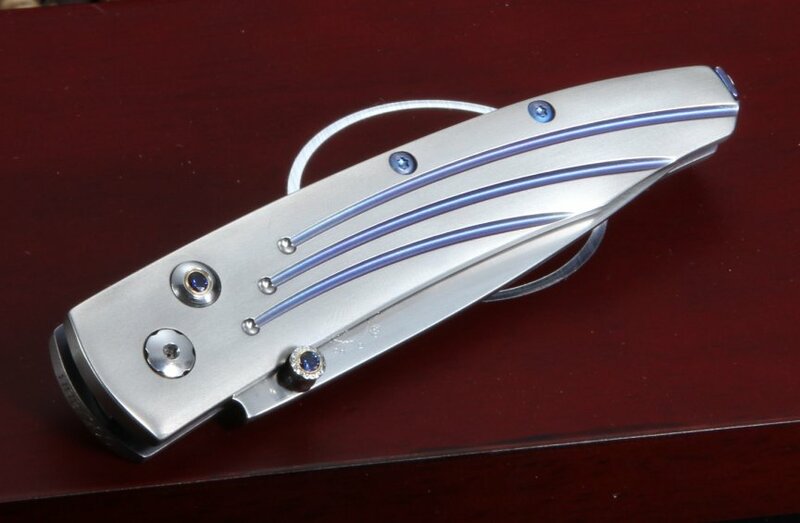 This knife is incredibly smooth, razor sharp, sleek and attractive, without being gaudy. It's so smooth and easy to open and close with one hand that it's almost hard to put down. You'll want to do it again and again! So far I haven't met a letter I couldn't open, or a label I couldn't remove. Good entry level full sized William Henry pocket knife. 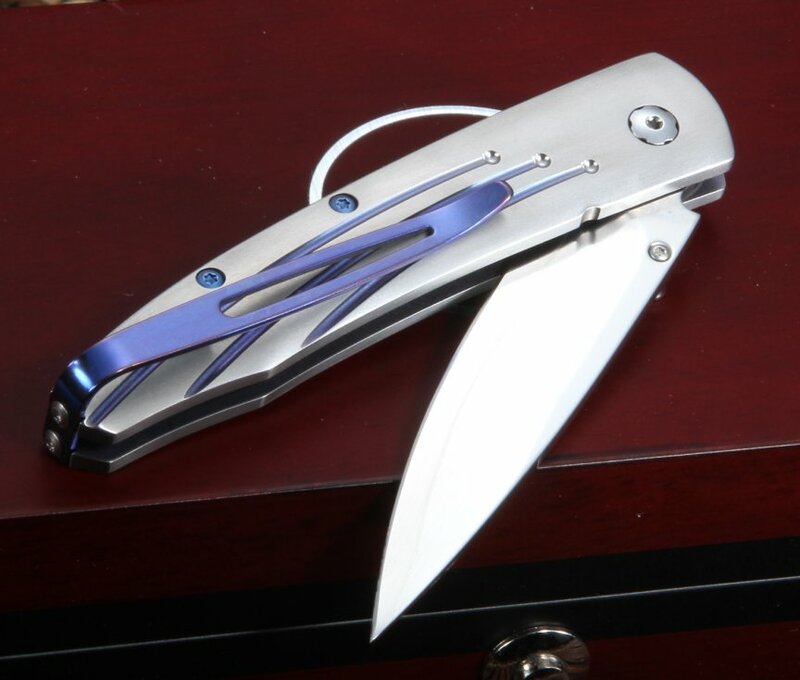 Not especially cheap, but razor sharp and can coexist with your pocket change and other pocket paraphernalia without sustaining too much damage. Will dull eventually but I've read that Wm Henry will resharpen their knives for you. Not for cutting through barbed wire.